Here are some snazzy birthday facts about 30th of January 1991 that no one tells you about. Don’t wait a minute longer and jump in using the content links below. Average read time of 10 minutes. Enjoy! What day was my birthday Jan 30, 1991? January 30, 1991 was a Wednesday and it was the 30th day of the year 1991. It was the 5th Wednesday of that year. The next time you can reuse your old 1991 calendar will be in 2019. Both calendars will be exactly the same! This is assuming you are not interested in the dates for Easter and other irregular holidays that are based on a lunisolar calendar. What day was January 30 this year? There are 284 days left before your next birthday. You will be 29 years old when that day comes. There have been 10,308 days from the day you were born up to today. If you’ve been sleeping 8 hours daily since birth, then you have slept a total of 3,436 days or 9.41 years. You spent 33% of your life sleeping. Since night and day always follow each other, there were precisely 350 full moons after you were born up to this day. How many of them did you see? The next full moon that you can see will be on May 18 at 21:13:00 GMT – Saturday. Fun stat: Your first one billion seconds (1,000,000,000) will happen sometime on October 8, 2022. If a dog named Mii-Ma - a Pekingese breed, was born on the same date as you then it will be 132 dog years old today. A dog’s first human year is equal to 15 dog years. Dogs age differently depending on breed and size. When you reach the age of 6 Mii-Ma will be 40 dog years old. From that point forward a small-sized dog like Mii-Ma will age 4 dog years for every human year. View the complete list of January 30 celebrity birthdays. Who are the famous January 30 birthdays? Here’s a short list of famous people in history who were born on Jan 30. View the complete list of January 30 famous birthdays. What happened on my birthday – Jan 30th? The original Lower Trenton Bridge (also called the Trenton Makes the World Takes Bridge), which spans the Delaware River between Morrisville, Pennsylvania and Trenton, New Jersey, is opened. Yerba Buena, California is renamed San Francisco. The first Anglo-Japanese Alliance is signed in London. Adolf Hitler is sworn in as Chancellor of Germany. World War II: Japanese forces invade the island of Ambon in the Dutch East Indies. World War II: The Wilhelm Gustloff, overfilled with German refugees, sinks in the Baltic Sea after being torpedoed by a Soviet submarine, killing approximately 9,500 people in what is the deadliest known maritime disaster. The African National Party is founded in Chad, through the merger of traditionalist parties. Some one million people attend former Prime Minister Sir Winston Churchill’s funeral, the biggest in the United Kingdom up to that point. Pakistan withdraws from the Commonwealth of Nations. Richard Skrenta writes the first PC virus code, which is 400 lines long and disguised as an Apple boot program called “Elk Cloner”. 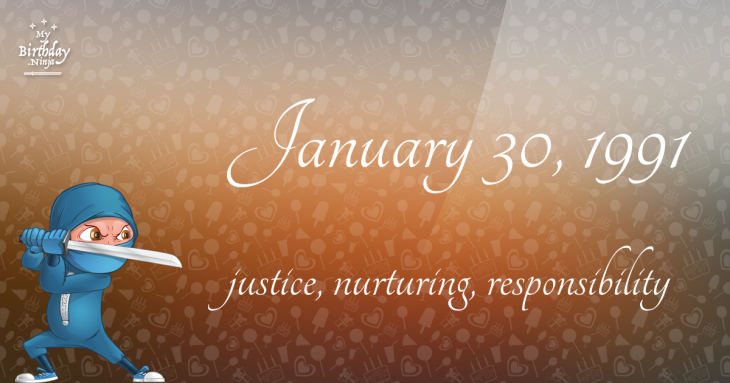 View the complete list of January 30 historical events. Curious about this Green Jelly Heart? This is a party item you can activate and send to your friends when you play the free game Jump Birthday Party. It’s a fun and easy-to-play mobile game for all ages. Get free 1,000 gold coins when you download today! What does my birthday January 30, 1991 mean? 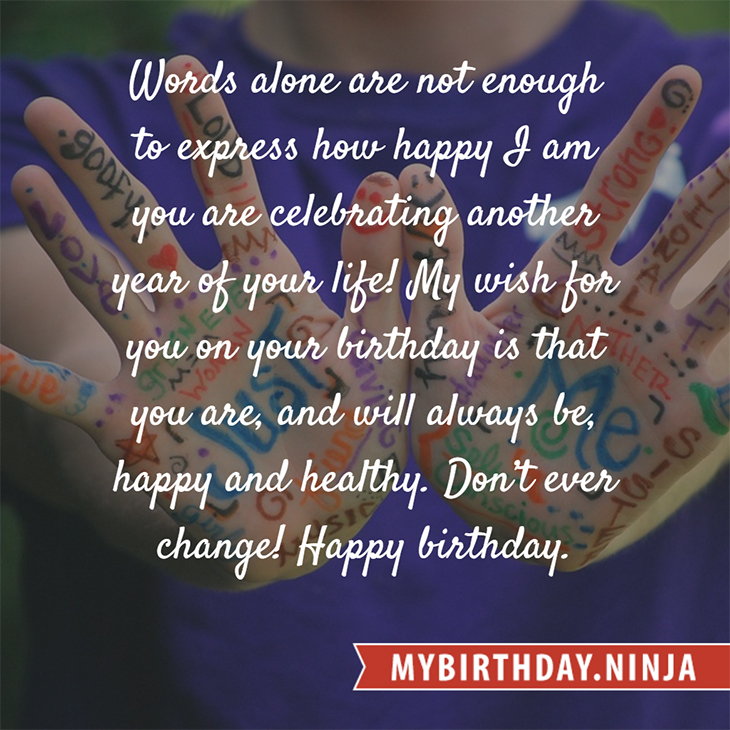 Your birthday numbers 1, 30, and 1991 reveal that your Life Path number is 6. It represents justice, nurturing and responsibility. You possess great compassion and seek to be of service to others. The following celebrities also have the same life path number: Ava Cadell, Frances Conroy, Masaki Kobayashi, Udo Kier, Saeko, Christina Perri, Ken Wahl, Marie-Christine Barrault, Aaron Russo, Danielle Savre. What is the birthday horoscope for Jan 30, 1991? The Western zodiac or sun sign of a person born on January 30 is Aquarius ♒ (The Water-bearer) – a fixed sign with Air as Western element. The ruling planet is Uranus – the planet of originality. According to the ancient art of Chinese astrology (or Eastern zodiac), Horse is the mythical animal and Metal is the Eastern element of a person born on January 30, 1991. What is the birthstone for January 30? Garnet is the modern birthstone for the month of January while Emerald is the mystical birth stone (based on Tibetan origin). The zodiac gemstone for Aquarius is garnet. Lastly, the birthday stone for the day of the week ‘Wednesday’ is amethyst. Fun fact: The birth flower for 30th January 1991 is Carnation for friendship. What is the Love Match for Jan 30, 1991? When it comes to love and relationship, you are most compatible with a person born on March 10, 1965. You have a Love Match compatibility score of +181. Imagine being in love with your soul mate. On the negative side, you are most incompatible with a person born on July 10, 1983. Your incompatibility score is -154. You’ll be like a cat and a dog on a love-hate relationship. Arf-arf, I want to bite you. Meow-meow, stay away from me! What is a good birthday trivia for January 30? How many babies were born on January 30, 1991? Base on the data published by the United Nations Population Division, an estimated 137,064,554 babies were born throughout the world in the year 1991. The estimated number of babies born on 30th January 1991 is 375,519. That’s equivalent to 261 babies every minute. Try to imagine if all of them are crying at the same time. What is the popular baby name on 30 Jan 1991? What’s your bizarre Florida Man story? The #FloridaManChallenge is breaking the Internet and social media. Some crazy men, women, or creatures from the Sunshine State are making headlines every day of the year including your birthday. Try this fun exercise. Pick your search engine of choice and type in “florida man January 30” and see what kind of wild news headline you will get. This viral craze started in 2013 and gets resurrected now and then. The latest was from Tumblr and found its way to Twitter. As they say, the rest is history. Here’s a quick list of all the fun birthday facts about January 30, 1991. Celebrities, famous birthdays, historical events, and past life were excluded. Try another birth date of someone you know or try the birthday of these celebrities: October 30, 1951 – Harry Hamlin, American actor; May 23, 1974 – Charlie Young, Taiwanese-Hong Kong actress and singer; May 15, 1990 – Lee Jong-hyun, South Korean singer-songwriter, guitarist, and actor (CNBLUE).